While fans still have to wait nine more days until John Wick 2 hits theaters, the stars all converged on Los Angeles last night for the world premiere of this action-packed sequel. The movie itself already serves as a reunion for Keanu Reeves and Laurence Fishburne after playing Neo and Morpheus in the 1999 blockbuster The Matrix and its subsequent sequels, but the premiere added one more to the reunion. While she doesn't have a role in the film, Carrie-Anne Moss, who played Trinity in The Matrix trilogy, stopped by to support her former co-stars, and round out this Matrix "trinity" of stars, so to speak. The photo was posted last night on the official Twitter account for John Wick: Chapter 2, showcasing the stars reuniting on the "black carpet." There has already been talk of John Wick 3, with director Chad Stahelski recently teasing that Lionsgate has asked him and writer Derek Kolstad to start coming up with ideas for the third movie, and the director also teased the possibility of a prequel TV series as well. 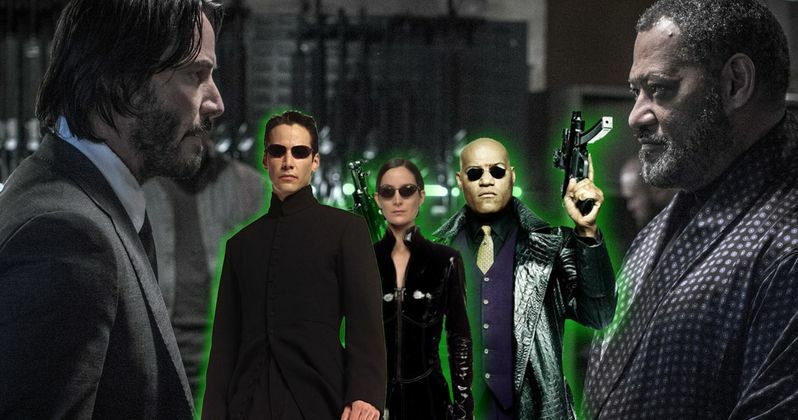 Perhaps if John Wick 3 does move forward, the filmmaker can find a role for Carrie-Anne Moss to make this Matrix "trinity" reunion complete on the big screen. Even the first John Wick movie served as a Matrix reunion. Director Chad Stahelski got his showbiz start way back in 1991 as an uncredited stunt double for Keanu Reeves in Point Break, and he returned to double Keanu Reeves again in The Matrix. He would also serve as the actor's stunt double in the 2003 sequels The Matrix Reloaded and The Matrix Revolutions, while also pulling double duty as a martial arts stunt coordinator. Before making his directorial debut with John Wick, he also served as the martial arts choreographer on Keanu Reeves' own directorial debut, Man of Tai Chi. For those who want to experience the action of John Wick for yourself, we reported earlier this week that a new John Wick virtual reality game called John Wick Chronicles will debut later this month, in conjunction with the John Wick: Chapter 2 theatrical release. John Wick Chronicles lets you play as the legendary assassin John Wick, allowing you to pick up his iconic weapons and head into the world of hired guns, all in virtual reality. In John Wick Chronicles you'll dive into a whole new way to experience the action, as you'll be a part of it, and not just someone who holds the controller. Enter the Continental Hotel, and pick up your first mission. Keanu Reeves returns in the sequel to the 2014 hit as legendary hitman John Wick who is forced to back out of retirement by a former associate plotting to seize control of a shadowy international assassins' guild. Bound by a blood oath to help him, John travels to Rome where he squares off against some of the world's deadliest killers. Lionsgate has set a February 10, 2017 release date for John Wick: Chapter 2, which puts this action sequel against Universal's Fifty Shades Darker and Warner Bros.' The LEGO Batman Movie. Take a look at these Matrix reunion photos from the John Wick 2 premiere below.